There are very few homes that can immediately transport you back to a simpler way of life from the moment you step inside, but the Horwoods’ is definitely one of them. 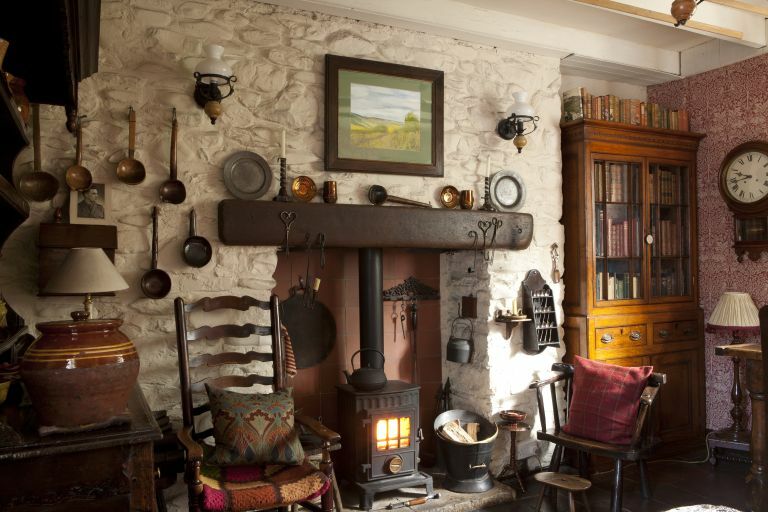 Without many of the trappings of contemporary living, this is a home that has a wood-burning stove in place of a television as a focal point in the sitting room, vintage utensils rather than gizmos in the kitchen, and traditional Welsh blankets, quilts and antique lace in everyday use in the bedrooms. It feels instantly welcoming and calm – a retreat away from the hustle and bustle of modern times. Of course, this is not a way of life that suits everyone, and neither would such a traditional renovation, but restoring the cottage to the most original state that money and practicality would allow, was something that owners Mike and Mitzi were passionate about. While Mike was reluctant to view the cottage because he feared that it would be too small, she persuaded him to see it, yet ironically it was Mitzi who was disappointed with the interior when they visited. ‘I had my dream of what I pictured a Welsh cottage to be – beams, an inglenook fireplace, stone walls and lots of character, and there wasn’t any here because it had been given a terrible 1960s makeover,’ she shudders. Mike remembers the graft only too well. ‘The first job was taking the skirting boards off and all of the plaster on the downstairs walls, which were damp. We took them back to the stone work and repointed them with traditional lime render. Then, we opened up the fireplace in the sitting room, put in a damp-proof course and installed fascia board and guttering on the back and front of the house before repointing it with lime,’ he says. ‘The next priority was to repair the roof. Damp had come through the slates and you could see daylight through them.’ A local builder re-felted the roof, then salvaged and relaid as many of the original slate tiles as possible. With the house more structurally sound, Mike removed the PVCu windows and replaced them with timber sashes handmade to the original pattern used on other local homes. Then, once he had removed the polystyrene tiles and taken the ceilings back to the beams, the couple turned their attention to the design of their home. With the help of a friend, Mike designed the small kitchen area to make maximum use of the space, with everything in reach on two simple shelves. The couple replaced the quarry floor tiles that were damaged by layers of thick black adhesive, with originals salvaged from a neighbour. When it came to decorating, Mitzi went to the National Museum Wales, in Cardiff , for inspiration. ‘I wanted our home to look like an old Welsh cottage and a lot of them had wallpaper,’ she says. She worked on a general theme of three autumnal colours, which she ‘weaves through the house so that it blends together,’ with pattern from wall coverings and her Welsh blankets and quilts. ‘When we first moved in we had to make do and mend. We had an old battered settee off someone for £25. After eight or nine years, we started collecting older pieces,’ which became a passion. When the couple’s television broke four years ago, they preferred instead reading by the side of the fire in the evenings, and so didn’t replace it.